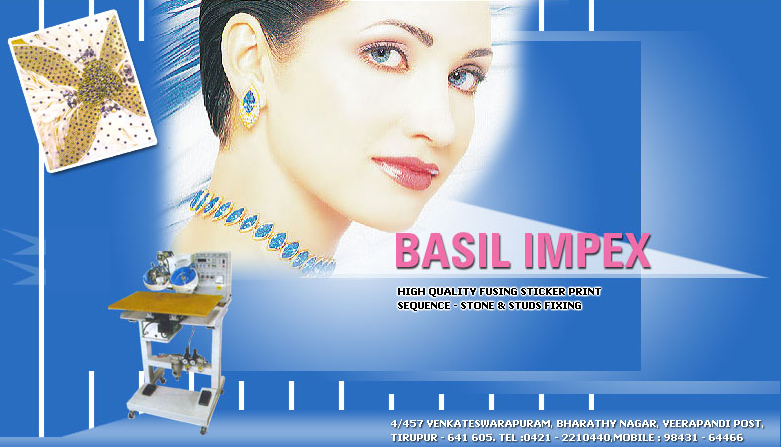 We are one of the leading printers in Tirupur. We are Specialist in High Quality Fusing Sticker print, Sequence - Stone & Studs Fixing. We are Multi Colour Foil Print, Flock & Embossing and Tie & Dye. These kind of prints are done at very high quality. We have very skilled and experienced 20 labours so as to finish and deliver the product in time. We have Hot Fixing Stone Sector 1 no, (Imported Semi automatic), Manual machine 1no. and Fusing Machines (press) 5 No. All kind of knitted printing. We have Hot Fixing Stone Sector 1 no, (It is Semi automatic), Manual machine 1no. and Fusing Machines (press) 5 No. Manual Chest Printing Machine 4 Nos.